The 14th Military Circle marked its 83rd anniversary at a ceremony in Chonburi. First Army commander Lt. Gen Theppong Thipjan chaired the Aug. 16 ceremony at the Navamin Camp in Chonburi. 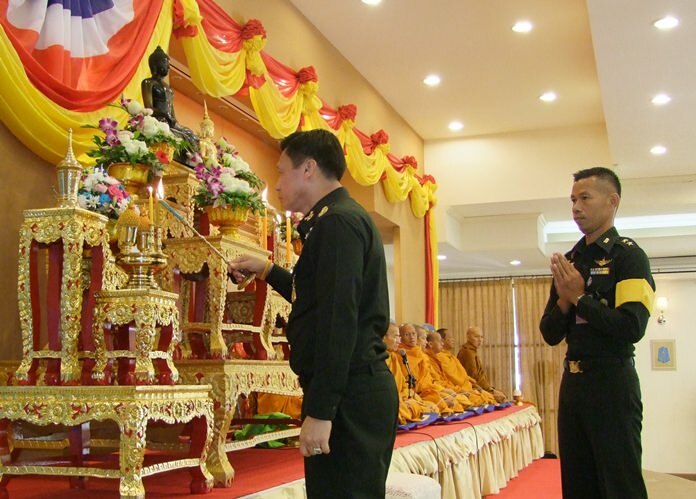 First Army commander Lt. Gen Theppong Thipjan leads religious services to mark the 14th Military Circle’s 83rd anniversary during a ceremony in Chonburi. The army branch was founded as the Chachoengsao Army District in charge of supporting administration and maintenance forces for Engineering Battalion 2, Royal Guard. Then, it moved to a location at Kittikachorn Camp in Muang District in 1970 to support Infantry Regiment 21, Queen’s Guard. The Royal Thai Army expanded the Chonburi Military District and appointed a commander with a major general rank. It was moved from the 2nd Army District to the First in 1981 and was made responsible for four provinces: Chonburi, Rayong, Chantaburi, and Trat.